I love how utterly alien this guy looks. 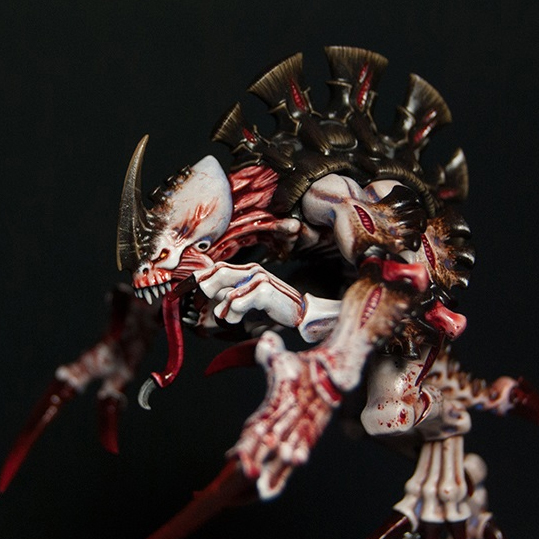 They have perfectly captured the disturbing "other" aspect of the Tyranids while also making it look suitably bug like. The color choices are great, with the pale skin and dark carapace contrasting perfectly. Even though they are very stark they are still completely organic looking. The redness of the skin makes it look very raw, and the mottling on it around joints is a nice touch. It gives it a feeling of being a real creature and not just a model. I am pretty sure this hobbyist was looking at reference photos of real bugs and lizards and such while painting this. The brown highlights on the carapace help make it feel real while keeping it dark as well. Of course all of the slick, wet, organic looking areas are what really make this feel disgusting. I really like how raw they went in the joints and neck. The red claws are a nice compliment to the rest of the mini, giving it a bit of an otherworldly feel while not going overboard with it. The base is also suitably gross, with what I can only assume are Tyranid excretions of some kind. 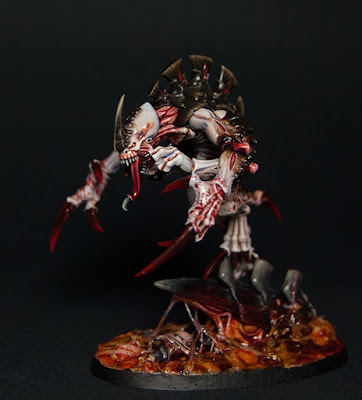 Overall this mini is very subtle, but perfectly captured the alien vibe that the Tyranids, and Genestealers in particular, should have. Be sure to check out more views of the model on Cool Mini or Not, and show the artist some love if you like it. For all of your own miniature needs visit Ministomp where you can get Games Workshop products for up to 30% off every day. They also have frequent model giveaways on their Twitter account, so be sure to follow them.